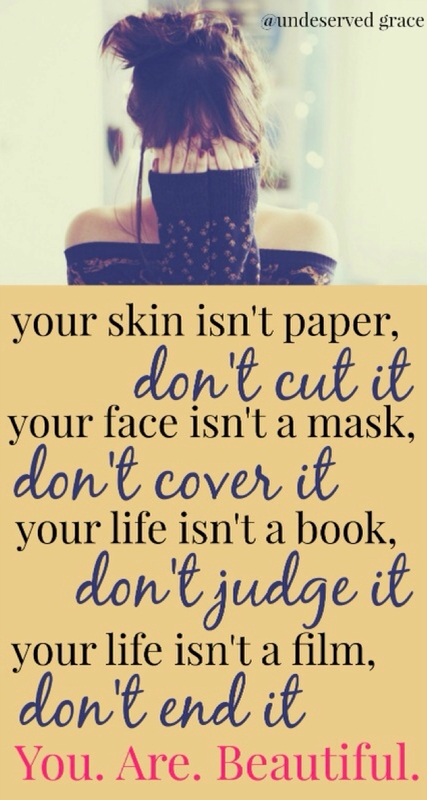 Your skin isn’t paper, don’t cut it. Your face isn’t a mask, don’t cover it. Let that set in…13 million! Bullying is a major issue that does not end once a student gets home, but continues on through social media, long after the final school bell rings. Any type of bullying, whether verbal, physical or in cyberspace should never be tolerated and needs to end! October is “National Bullying Prevention Month.” I want to encourage everyone to Speak Up and Stop Bullying if you see it going on because the ramifications can be enormous! At a minimum, feelings of inadequacy because of a lack of friends will result, but more than likely, depression will set in. Just look at the what happened the other day when an incoming high-school freshman named Hannah reached out to Taylor Swift on Instagram, (Sunday – 9/7/14) to share her heartbreaking fears of being bullied in the new school year. The 24-year-old singer responded so compassionately to her High School fan that it made headlines. You can read the article here that shares the exchange. Depression and hopelessness are real, and if you are suffering from this, know you are NOT alone! Beside millions of other people who are experiencing some form of depression, God is with you always, even if you do not have a relationship with Him, God is just one prayer away…All you need to do is take one step in the His direction and just like a Daddy running to His child that is hurt, so your Heavenly Father will come running to you! God is just waiting for you to make a move in His direction. But sometimes that is so hard to conceive of a loving father in heaven right? Do you know why that is? Because of the war that we are in. What war you ask? 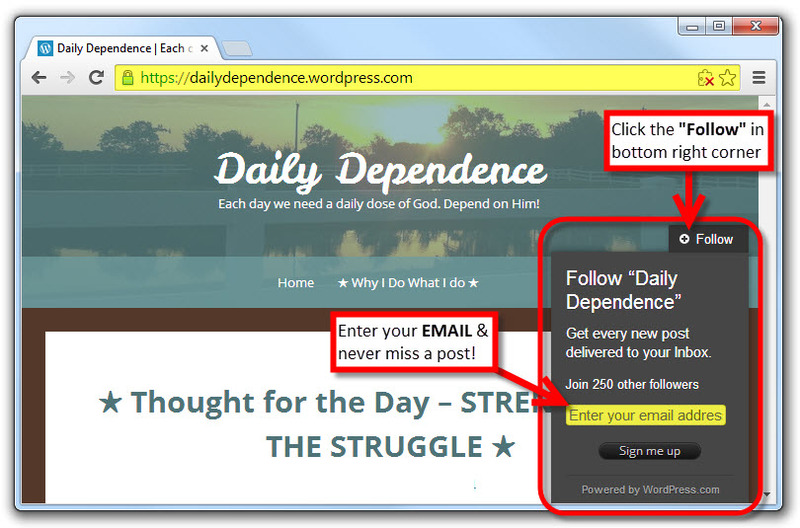 The war for our mind, for our life, for our eternal soul…we are in a spiritual battle with a very real enemy…the Devil tries very hard to cause doubt, confusion, and disillusionment about God’s character and about our identity as a “Child of God.” That is why allowing depression to continue is so dangerous. So many people suffer from it but never talk about it because of the stigma that society places on it. Whether it is from fear of people minimizing your feelings or not wanting to appear weak or ________ (you fill in the blank)…The silent killer of souls continues to rage on. God says we are CHOSEN! You are an adopted child though Jesus Christ! All you need to do is make the decision to release the guilt, the shame, the hurt, whatever it is, and accept the free gift of Grace and Salvation through faith in Jesus’ death and resurrection for the payment of ANY past, present and future sins! (See Romans 10:8-13 to read more). 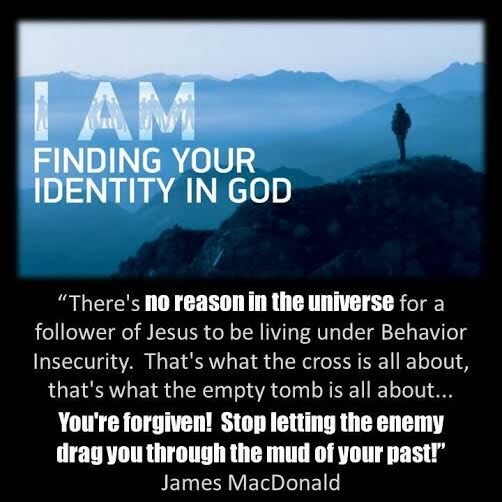 Maybe you are a Christian already, but still struggle with depression or insecurities or guilt, James MacDonald made this profound statement during his “I AM: Finding your Identity in God” series that I pray will wash over your spirit and that you will receive the grace of God. Kick the negative thoughts and the enemy to the curb!! You are loved and forgiven! God is just one prayer away. What will you do? Thank you so much Carolyn for your kind words, it means a lot! I love the Lord and love to encourage and build up His people! God bless! May God Bless You & Your Ministry. Yes we are chosen; as a child of God we are to be a witness to the lost and edify Brothers & Sisters in Christ. Being an Atheist the hardest thing I’ve ever done in my life was to BELIEVE in God and that his Son died & was resurrected for “MY SINS”. The easiest thing I’ve ever done in my life was to be SAVED. While Christ was here he was the light, now we are to be that light so that others might see Christ in us. My Sister, (Who was an outstanding Christian & is present with the Lord), was battling depression. I told her depression is nothing to get depressed about! It can be a viscous cycle that even a Christian cannot pull themselves out of without God’s Help. I am so blessed by your words Bill! I am so thankful that the Lord has drawn you out of atheism. Thank you for your support.